AKTAU, August 12./TASS/. The presidents of Russia, Kazakhstan, Iran, Azerbaijan and Turkmenistan have signed a convention on the status of the Caspian Sea. At the fifth Caspian summit, Vladimir Putin, Nursultan Nazarbayev, Hasan Rouhani, Ilkham Aliyev and Gurbanguly Berdymukhamedov inked the document determining the legal status of the Caspian Sea. Work on the document has continued since 1996, while its draft was agreed by the five nations’ foreign ministers on December 4-5, 2017 in Moscow. Foreign Minister Sergey Lavrov said earlier that the very fact of passing the convention would be a major breakthrough. He said the Caspian quintet would get a "reliable legal foundation giving a possibility to achieve a higher level of cooperation". Several other documents on regional cooperation were signed at the summit. 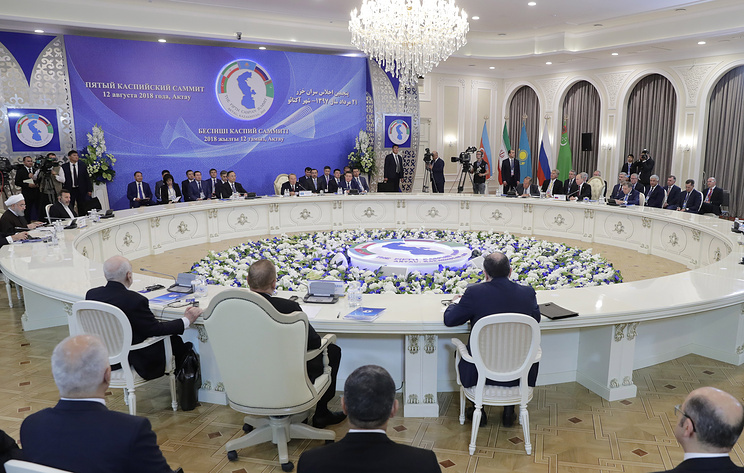 In particular, the parties signed a protocol on cooperation in fight against terrorism, a protocol on cooperation in fight against organized crime as well as an agreement to avoid incidents in the Caspian Sea. In the economic sector, the countries bordering the Caspian Sea signed an agreement on trade and economic cooperation as well as an agreement on cooperation in the transport sector. Besides, the parties signed a protocol on cooperation and interaction of frontier agencies.